Or are they walking me? I’m never quite sure. 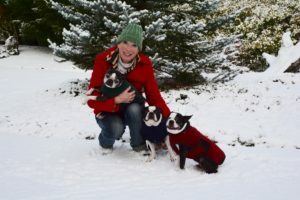 My intent is to give the Three Little Bat-Eared Pig Dogs (AKA Boston Terriors) fresh air, exercise, and sniffing, marking and elimination opps. They are indoor dogs, in case you haven’t guessed. Thin-coated, snub-nosed wusses. Northwest Lesser Knee Sloths. They have their small outdoor dog-yard for early morning and evening “business” trips. Fenced, bark-covered areas beyond back door and deck. But there’s nothing like the wide open spaces down and beside our wild and winding half-mile private lane. Ahh, the sweet-smelling morning air scented with essence of grasses, wild flowers, oaks, blackberry vines and … Morning! The calls of the towhee and flicker. The feeling of peace and possibility that fills me as my body responds with purpose or repose to the whims of the dogs. Yank! A jerk on the leash, and I step into a course change. Thunk! I come to a dead stop. Bam! A steady pull, and I reverse direction as my characters investigate some heretofore unnoticed but fascinating arrangement of bark and leaves — hiding poop under it. Big poop. Maybe not even neighbor-dog poop. Looks like bear, to me. Has this ever happened to you? To your best-laid plans for a walk, a visit, a writing project? Don’t all raise your hands at once. That’s right. Plans are meant to be changed. Givens, meant to be not-so-much. It’s called L-I-F-E.
And dog-walking. You pick up the leash, take a deep breath, let it out slowly, and follow where the Little Bat-Eared Pig Dogs go. You keep to a general path or guiding plan. They (and your conscious and subconscious) wander at will or whim along that lane. But you also allow for pit stops, course changes and sweet or not-so-sweet surprises. That’s called serendipity. Alternately, “Going with the Flow.” So to speak. This approach worked for my New West mystery, “Saddle Tramps.” And it’s worked for my upcoming sequel, “Over the Edge.” So I have to keep at it. My takeaway? Loosen or tighten the leash, as needed. How the dogs and I get where we’re going is as important at getting there. What we discover along the way may be mundane, but it also may be priceless. At very least, worthy of inspection. It’s what the dogs say. They know more than we think!